It is always important, especially for those working in corporate firms, to do something off the regular work to help oneself perform better and it could be anything he/she is passionate about. Hyatt introduces a unique concept for every passionate cook to exhibit the talent, along with a cause to cook, through its culinary challenge. Read on! 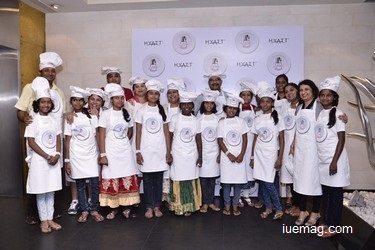 Hyatt organized its culinary Challenge on the 31st of October, 2015 where, individuals from the corporate got an opportunity to showcase his/her cooking talent and gain recognition for their efforts. Along with this, the children from the SMILE Foundation, got a chance to join a participant each and involve themselves. While the children enjoyed and learned how to cook, the participants loved to prepare their dishes along with these innocent hearts. “I have been learning to cook from the last 2 months and is a different experience to be here competing. The girl from the Smile Foundation was also helping and I ensured that she is careful while chopping the vegetables or any other kind of help. The cause brings me here and truly happy to see the kids engaged”, says Awanish Kumar, virtual partner Marketing manager at CISCO. Ruby Chakravarthi who was there to support her friends participating also states, “It’s wonderful to know how the concept has emerged. I have enjoyed the whole of it and the kids also seem to have a lot of fun”. A digital competition was also held, for which one participant was selected to participate in the preliminary round and Jyothi Rajesh, Food blogger and Photographer who won the online competition shares, “I'm glad to be here and this is the second time I’m a part of the competition. I believe this is a platform to not just showcase our talent, but also get a break from the work pressure, get more energized and do something innovative to keep our inner selves happy”. While the participants and the audience savoured every moment, the organizers took utmost care to ensure that every participant, the guests and the kids experience the moments they get to relish for lifetime. 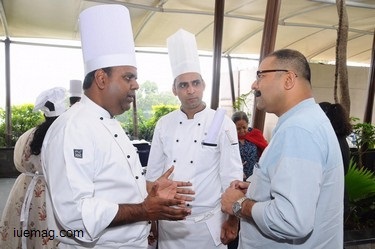 Manas Banerjee, General Manager at Hyatt Bangalore adds, “The Hyatt Culinary Challenge 2015, where ‘people are cooking for people’ is the second edition and we are proud to be hosting it this year as well. Hyatt Culinary Challenge exemplifies our commitment to making a difference in the lives of those we touch every day. Cooking together can turn simple moments into memories and I am especially grateful to the Smile India Foundation for partnering with us in this event. I am delighted to see such a wonderful response from all our partners and supporters for this event as some senior corporate leaders are coming together to cook for a social cause in this pan India Hyatt culinary challenge. We are glad that people want us to organize often and they follow us up asking about the next event. The kids of Smile foundation have added liveliness to the entire event”. The competition began with the participants cooking and then, was the tough time for the judges to choose the best recipe for the day. Ruma singh, food blogger who was one of the 3 judges says, “It was a tough competition to judge and we considered every aspect of the cuisine to be sure that the right person wins. It’s nice to see the whole of the busy world taking out time for such events and I am also looking forward for more such events from Hyatt and the organizers have done a brilliant job on that end”. The participants, audience and the kids from the Smile Foundation enjoyed the whole day with the background of music played by Neil Andrade and team. Although it was hard to choose the winner, the judges were meant to do it and hence, finalized the winner as Miss. Preeti Marwah, a home maker and an enthusiastic individual who became extremely delighted to have won the competition. She shares, “Last year also I got to be here and have fun. This time I'm here again but going back with the memory of winning moment!”. The kids from SMILE Foundation were the reason for many smiles this day and they also got a chance to meet people from the outside world of theirs. It was a moment of Joy for every child and they all happened to speak to IUeMagazine and also shared that they learned a lot and would go back and cook all the dishes they learned at the event. The whole of this life is worth living when you know that you have been the reason for at least a smile. Hyatt’s culinary challenge becomes a memorable event for every participant who take back huge learnings and wait for the next season. Meanwhile, the winners from every city wait for the final round of the competition on November 15, 2105.